Nowadays, a website can do one of the two things for you – make or break the goals of your business. Its functioning and appearance, as well as the value provided in it, are your grandest tool in making a good first impression. And while you probably have the impression that this is costly, your budget for digital marketing does not have to be big to start achieving good results. Sometimes even the big investments can fail you. The secret recipe for a good online business lies in the details, the small errors that marketers do and the mistakes that cost them their success. For that particular reason, we’ve made a list of the eight mistakes you might be making that are causing visitors to abandon your business’ website. Every business wants to build a database of customers and followers, so you probably have some forms on your website, too. Forms convert the visitors into leads and everyone knows it. But, even if you do your best to insert a form that will gain you some insight about your audience and provide you with their information, you can still go wrong about it. As a result, you can get insufficient information from your customers. Your ‘mandatory subscription’ can chase away many of the potential leads. Or, if you create a form that lacks some basic explanation and information attached to it, visitors will simply move on to someone from your competition. But, the worst mistake with creating forms on your website is if you request without providing anything. People aren’t very willing to just ‘hand out’ their personal information to websites without getting anything in return. If you do decide to use a form to convert customers into leads, make sure you are offering something in return. You might decide to limit the forms on your website to avoid overwhelming the audience. This is not wrong. However, one form simply must exist on any business website – the contact form. Contact information is one of the key things to add to your website, but making this process simpler for the visitor is a must on today’s online market. People often visit websites with a specific thing in mind. Don’t expect them to spend hours looking through your pages, struggling to find what they came for. Without a search option, almost all visitors who don’t see their answers on the homepage will leave your websites in less than a minute. If visitors found your business’ website as a result of their search, they will expect to find a search box on each page. 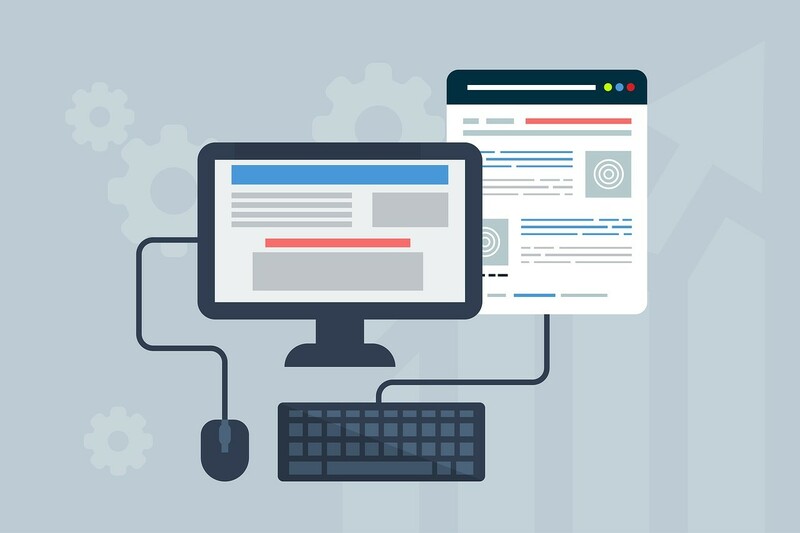 This should be one of your top priorities – to connect your website’s pages and make it possible for the visitor to access more than one. The longer a visitor lingers on your pages, the higher are your chances of converting them into leads. There’s no reason why you should limit the visitors’ search to your website only. Don’t let visitors bounce from your website just because they had to go back and look for some extra information in a search engine. Integrate Google’s Custom Search feature into the business’ website to make it possible to have a search function throughout your website. It has a very similar look that people are accustomed to, and it will fit perfectly in the corner of your pages. Complicated, varied, and wrong-sized fonts are your biggest enemy. If your visitors cannot read the content you wrote, all your efforts will be in vain. When thinking of fonts, think of color, size, and background. A transparent color can make your content hard to read, and you should definitely pay attention to how readable it is on a chosen background. This doesn’t mean that you should avoid attention-grabbing colors. Make visitors excited about the content by grabbing their attention with the color and highlighters’ use, but first of all, ensure that your fonts are readable. The poorly sized font doesn’t just apply to your laptop screen. The font should fit every screen and be readable, even on the smallest ones. If you choose an incorrect font, you will end up losing your visitors – and quickly. If you don’t know what font to use, check out the safest website fonts. Content is king. There is hardly a chance that any experienced marketer on the web hasn’t heard this at least once or read about it while studying SEO techniques. When it comes to search engine optimization, content is on the very top of every list. Naturally, many of the mistakes being made on websites are related to this important part. The content is the tool marketers use to reach their customers and provide them with information, push them to take action and turn into leads. That being said, your content needs to be perfect, but also well-organized. In addition to writing quality content and using the right fonts to present it, you need a content organization. This includes proper formatting, bullet points, headings, keywords, white space, short sentences, as well as highlighting of the most important elements. Visitors often lack the time to read through the entire page, which makes it your job to make it easier for them to find the key information. If you need help with this matter or your content skills do not seem to be working, perhaps it is best to start by hiring a professional in the field, such as the Essay on Time service. This should not be a problem if you hire a good professional, but if you do decide to write your own content, accept that you will make mistakes. You can be the most careful that a person can be, work on your content for hours and days, and still make a mistake. The first draft is always far from the most perfect version of a piece of content. No matter how common this is, it is still embarrassing and unprofessional for a business to leave out typos and errors on their website. If you want to appear professional and avoid bounces, you need to to have good proofreading tools – always. To save yourself from such embarrassment, make sure to keep tools like Grammarly and Ginger near you. Interface design demands creativity. If your goal is to make your visitors remember your brand and your products, you need to work on their experience on your website. Aesthetics do matter in website creation, and an inconsistent interface can do a great deal of harm for your online appearance. You should definitely be creative, but don’t go overboard. User experience depends on both creativity and consistency, and focusing on one at the cost of the other is one of the biggest mistakes you can make. Inconsistent interfaces confuse visitors and will make you lose more leads instead of converting them. This is the main reason why websites have a menu – navigation. Use the menu on your business’ website wisely – to provide visitors with a roadmap to use while visiting your site. If you want them to get the most out of your design, content, and business, navigation is essential. When it comes to navigation, you need a simple and easy-to-find menu. If your attempts failed you before, use the three click rule – give your visitors what they need in three clicks or less. Users may want some more information, and this definitely does not mean that you should not provide it. However, streamline their process in a way that keeps your website simple. The more complex your navigation is, the lower will your odds be of keeping visitors on it. Let’s face it – not all people open websites from their laptops. In fact, most people nowadays use their smartphones to access a website, so what do you think happens when the screen resolution on their phone screen is bad? The obvious – they leave it and move forward. This is why companies aim to design websites that are mobile-friendly. Over 60% of those who did this noticed an increase in sales, so if you aren’t doing it, it is definitely a time for you to start. All devices are different and there aren’t really fixed standards for all screens. But, if you want to make sales in the digital, modern era, you need to place your focus on mobile devices. Browsing on mobile devices has already surpassed desktop browsing, which makes a mobile-friendly interface a must for any business. If you don’t know how well your website performs on different devices, use analytics services. Find out what devices are used to access your website, and check how your website looks on different devices. Bad website design can ruin your business’ chances of succeeding. On the other hand, great design will mark your company as great and get your brand out there. The more time and effort you invest in it, the more people you can attract to buy your products and services. The internet provides businesses with a unique opportunity to make more sales than ever and on a worldwide level. At this point and throughout history, there is no stronger tool than an online advertisement. It is what gets your brand out there and opens up many opportunities for leads – but only if you do it well.